The fastest growing privately held businesses in the area will be honored. Metro 50 is an annual dinner and awards program honoring these fast-growing businesses that have more than $1 million in operating revenue. 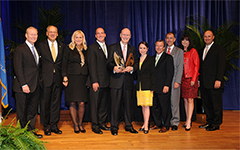 The ranking of all Metro 50 winners will be revealed by Mayor Cornett during this dynamic dinner. All Metro 50 winners exemplify the creativity and entrepreneurial spirit that make Greater Oklahoma City the best place to live and work. View the qualifications to apply. The application deadline for the 2014 Metro 50 has passed. If you applied for the 2014 Metro 50, award winners will be notified August 1. Tickets are $100 each. Corporate tables of 10 are available for $1,000. For more information, email registration. Sponsored by Bank of Oklahoma, Cox Business, EY, LLP, Express Employment Professionals, Hartzog Conger Cason & Neville, The Journal Record Publishing Company, OGE Energy Corp. and the Greater Oklahoma City Chamber.